I love that you can take a weed and turn it into a delicious soup. Spring is the time to harvest young nettle tops, but you need to be well prepared for picking. I bring rubber gloves and clippers so I won’t get stung and I go to a secret location in Seattle. I know I’m not the only harvester who goes there though because when I arrived at my spot, there were many nettles that had already been clipped. The beauty is that you’re not really harming the plant as it grows again from the side shoots, so everybody wins. And besides the soup, you can enjoy a healthful tonic-a friend of mine with ties to the Native American community here told me that it’s traditional to make a tea from the young nettles and drink it as a cleansing spring tonic. The first step to making soup is to blanch the nettle tops, so I save the water I blanch the nettles in and drink it as a tea. It’s actually quite good, very herbaceous and feels like you’re doing something good for yourself. 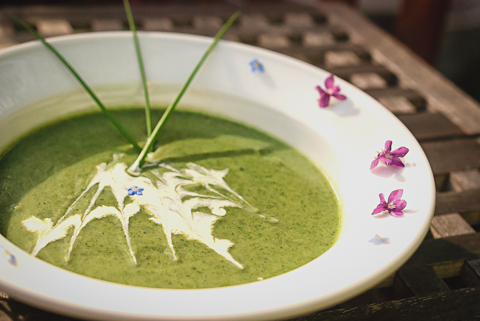 I use Julia Child’s basic potato leek soup, add the nettles and then puree. Add a salad and some crusty bread and it makes a delicious and good for you light meal. -Combine potatoes, leeks, water, salt and pepper to taste and simmer 45-60 minutes until vegetables are tender. -While the soup is simmering, fill a large pot with water and 2-3 tblsp of salt and bring it to a boil. When water is boiling, add the nettles (probably 2-3 cups fresh, but use gloves if you’re going to measure!) and blanch for 30 seconds. Pour off a cup or so for your tonic and drain the nettles in a colander. Put nettles immediately into a bowl of ice water to stop the cooking and set aside. -When the soup is done and the vegetables are tender, add the nettles and cook for another 5 minutes at a simmer. -Remove from heat and puree with a hand held blender or regular blender. Taste and adjust seasoning as needed. Serve by itself or with a splash of cream for decoration. Enjoy!